AD 1800. William Round, Joseph Bird, church wardens. For the better accommodation of the Neighbourhood this Pump was removed to the Spot where it now stands. The spring by which it is supplied is situated four feet eastward and round it as History informs us the Parish Clerks of London in remote Ages annually performed sacred Plays that custom caused it to be denominated Clerks Well and from which this Parish derived its Name. The water was greatly esteemed by the Prior and Brethren of the Order of St. John of Jerusalem and the Benedictine Nuns in the Neighbourhood. 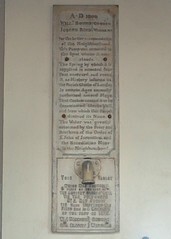 This tablet which was formerly fixed on the site of the ancient clerk's well viz the pumphouse no. 2 Ray Street 119 yards westward was fixed here as a memento of the past in 1878. W.J. Harrison, Geo. Blackie, church wardens.